Mortgage balances increased substantially, and the median credit score of borrowers for new mortgages decreased slightly. The share of mortgage balances that were 90 or more days delinquent (“seriously delinquent”) continued to improve. Notably, the share of mortgages in early delinquency that “cured” by becoming current on the debt improved to 35.9%, from 30.9% in the third quarter. Auto loan balances continued their steady rise seen since 2011. Although originations decreased slightly in the quarter, 2017 had the highest annual auto loan origination volume observed in the New York Fed data. Credit card balances increased and flows into serious delinquency have increased since the third quarter of 2016. Outstanding student loan balances increased. 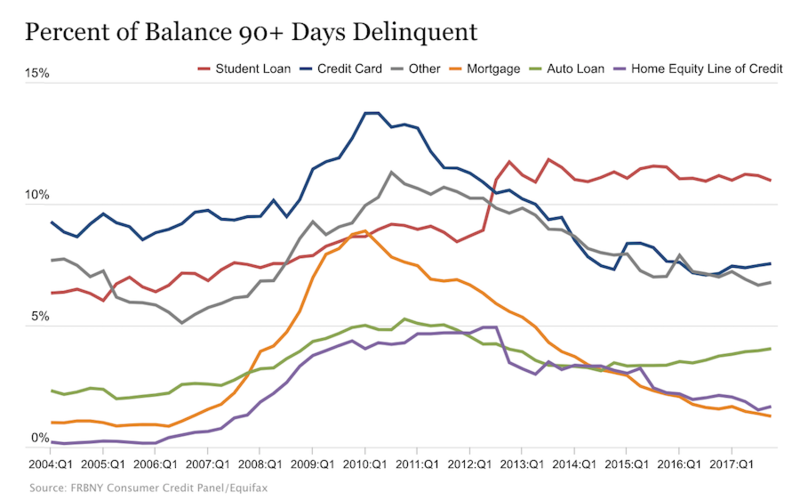 Student loan delinquency flows declined slightly but remain at a high level. Bankruptcy notations decreased for the second consecutive quarter. Foreclosure notations remained essentially unchanged at the lowest levels observed in the New York Fed’s data. See the full FED Household Debt and Credit report.